Welcome to Warren Peace! 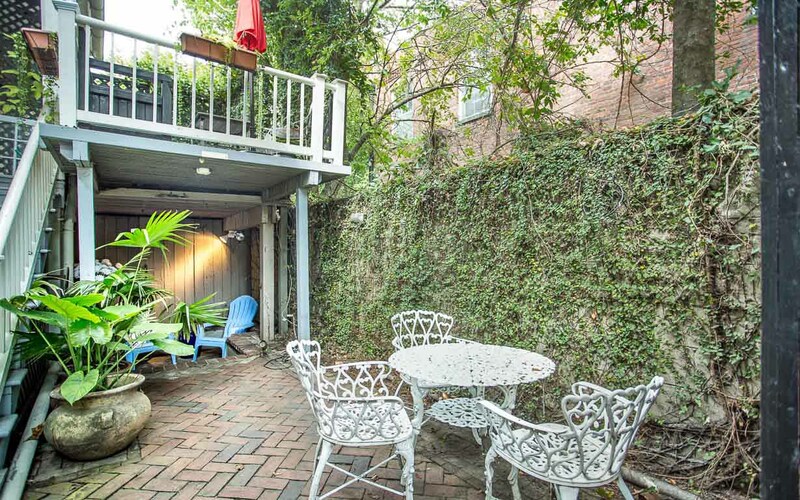 This may be the brightest garden apartment in downtown Savannah! A place where Lucky Pups are welcome. 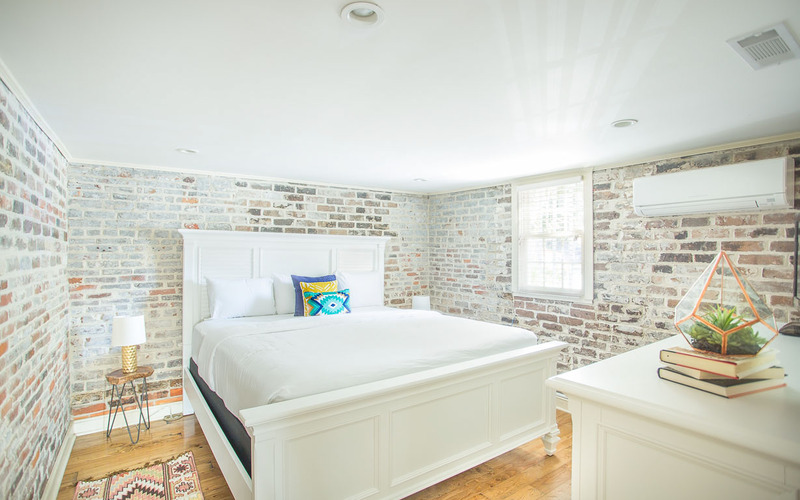 Settle into exposed brick and architectural detail. 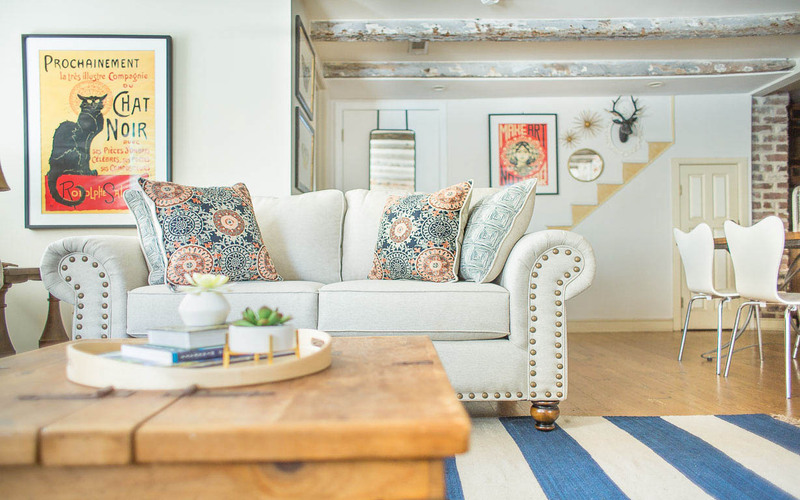 New furnishings mix with old to create an inviting home away from home. The living room has ample seating for friends. Catch up on your favorite TV shows each night. Look carefully and find signs of the original stairs from garden level to main house. The dining table comfortably seats four. Cook a full meal and enjoy your historic abode. 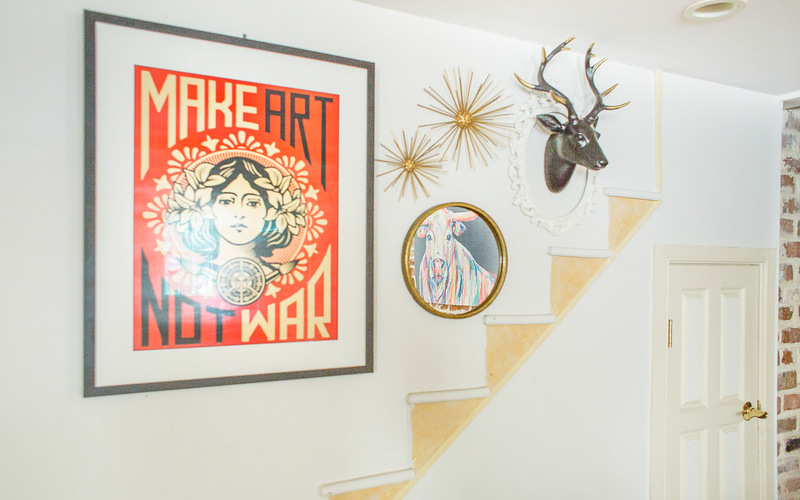 Eclectic art adds a modern spin to this old house. View of the dining area in between kitchen and master bedroom. The kitchen has every essential you - and your pup - will need! View of the kitchen and front door. The master bedroom has a King size bed. Ditch the suitcase and unpack - stay a while! The full bath has a single vanity and tub/shower combo. The bath has a whirlpool soaking tub. View of the courtyard entry. 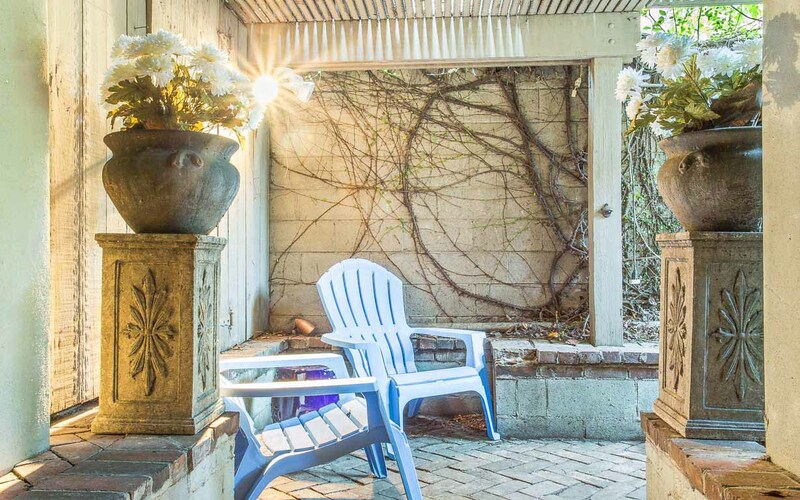 Sip a glass of wine in your private courtyard. Relax in this "sweetheart" wrought iron patio set. The owners live quietly above. View of the apartment entrance. The garden apartment is in the bottom right of this historical home. 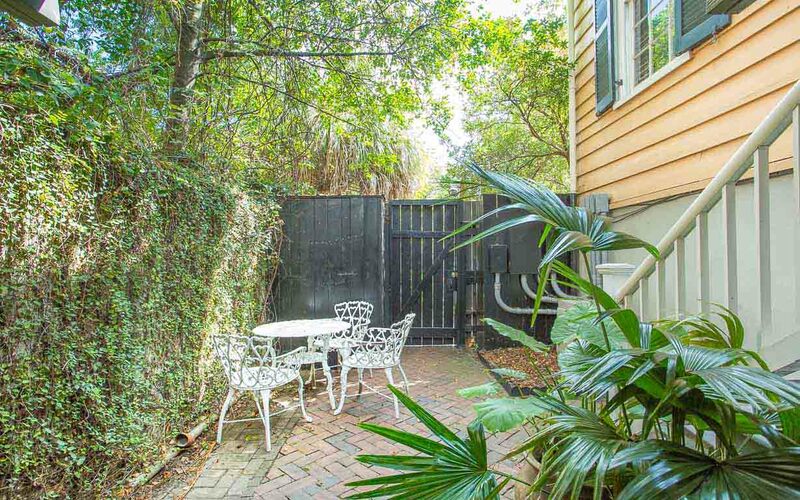 Our sleekly styled, one-bedroom, one-bath garden apartment has the benefit of being just one block away from River Street. 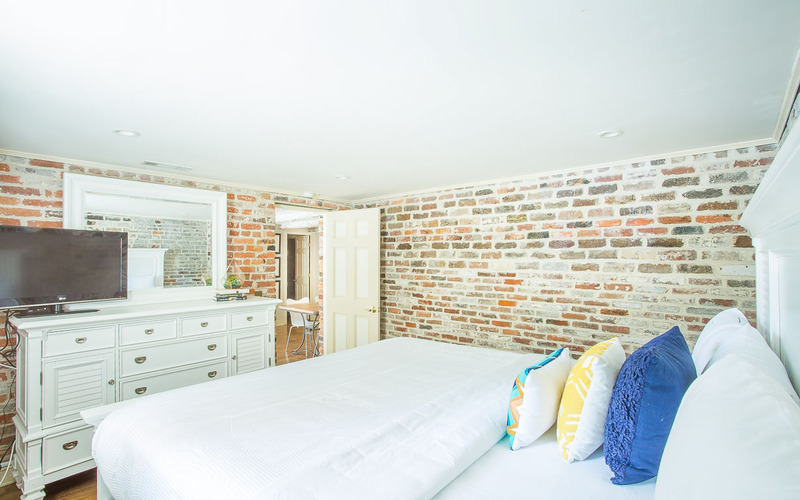 Accommodating four Lucky guests and situated conveniently on Warren Square, visitors will find this is the perfect location from which to experience the diversity of Savannah’s culture and nightlife. 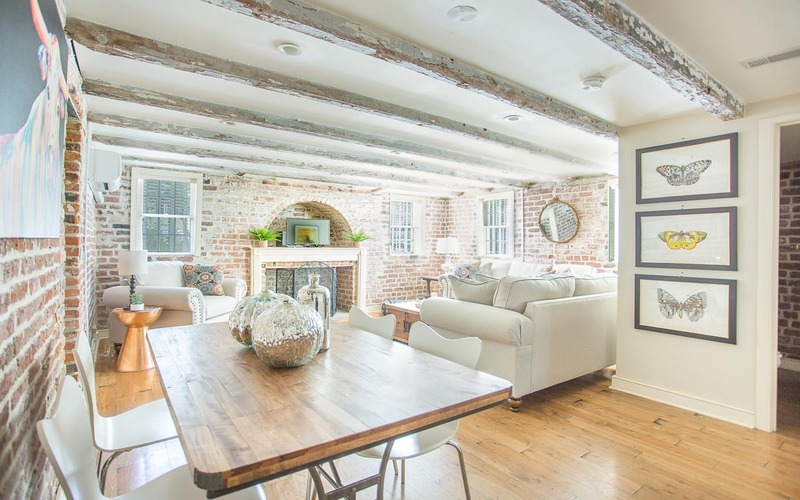 The décor of this charming home draws warmth from the exposed brick and wood beamed ceilings. 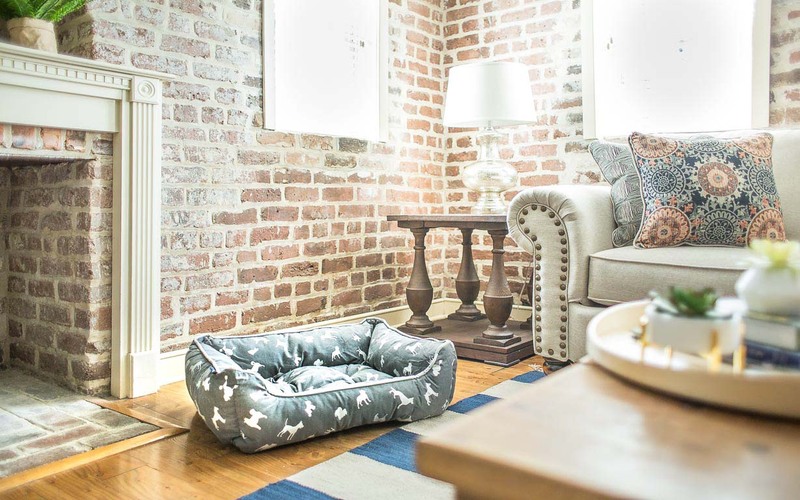 The bedroom has a comfy King bed and original brickwork, and the spacious living room has two plush sofas (with Queen sleeper) and a bed for Fido, too. 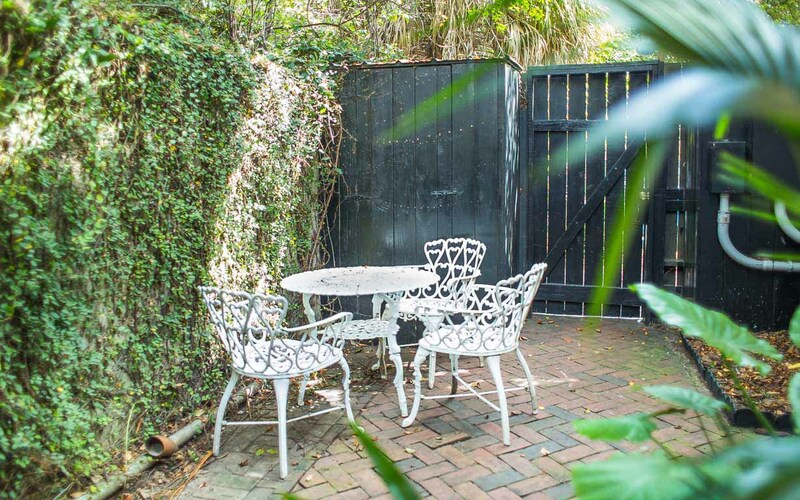 Enjoy a cocktail in your private courtyard behind the ivy-covered gate, or have a relaxing soak the newly renovated bathroom’s whirlpool tub. 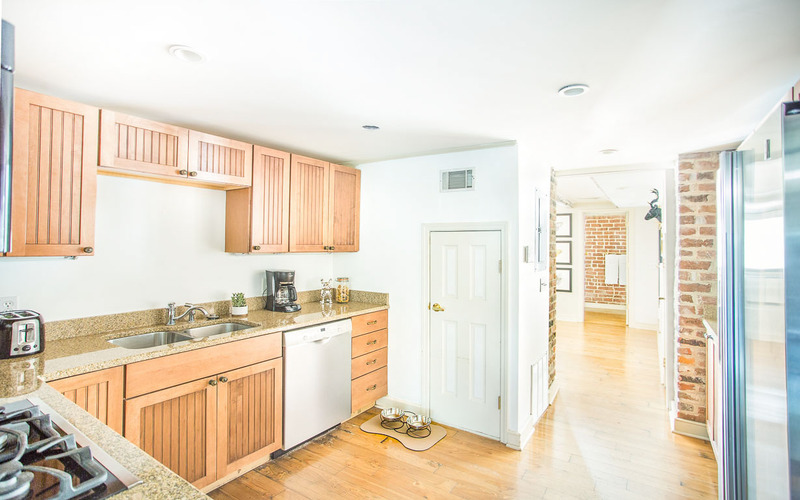 An updated and fully stocked kitchen, cable television and wireless Internet make this an exceptionally convenient spot to call home… even just for a few days. 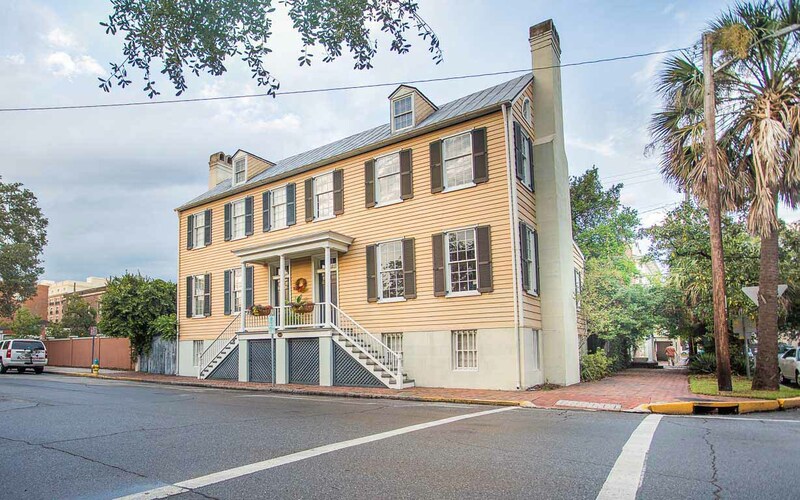 Conveniently located in Savannah’s Landmark Historic District, this home’s proximity to the Riverfront means that you’ll hear the fog horns of approaching ships while you sip your morning coffee, and some nights you can take in fireworks displays right from your front door. Plus, you and your guests are only a block away the sights of Broughton Street, or a delicious meal at B. Matthew’s. 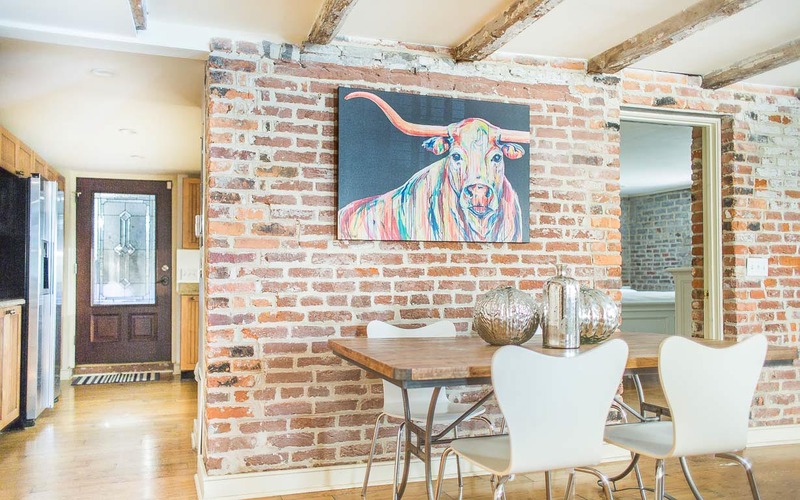 You’ll feel like a local in this unique and truly special Savannah vacation rental, so don’t wait another day to book your Lucky dates today. Parking: Rental of this unit includes a parking pass for the nearby Lincoln Street parking garage. We thoroughly enjoyed our stay at Warren Peace. The location is wonderful. We were able to walk to places to eat and to local shops. The property was very clean and comfortable. Our family had a great trip! Wife and I spent a long week end here. Perfect location to explore Savannah! Couldn't beat the price for the accommodations you get. We arrived on Thursday and parked the car in the parking garage, never went back to the car until it was time to go home. Everything to see and do is within walking distance. The property manager responded quickly to all my questions. We just spent a week at Warren Peace. Pictures are exactly how this lovely place looks. Well equipped for a weeks stay...the kitchen was well appointed for us. All in All this was a fine place for us for a week. On the negative...the Courtyard did not appear to be in the best condition. We did call and they sent someone to wipe down the chairs and table..mentioned they would send someone the next day to clean up better. They never came. Can at on hour of power washing and raking could have made our time outside more relaxing. Was quite neglected. One other issue..the dog upstairs was a nervous type and was disturbing at times. Great location on Warren Square. The apartment is beautifully appointed and pet friendly. We had a hard time accessing the apartment to begin with. The lock box was hidden by ivy on the wall. The access gate sticks and is hard to use. The apartment was clean and eye pleasing. Very comfortable. The location was quiet, on a beautiful square. could use some cushions for the outdoor furniture. The apartment has some electrical outlets that do not work. I had to use the hairdryer in the kitchen. The tub was a bit dificult. The furniture was comfortable. All in all I would rent here again. Room was clean very neat in a perfect location easy to enter. Property description regarding the location, layout and location was right on. The apartment was very clean with an abundance of towels and other items that made the stay more enjoyable. River Street, the Historic district and, other attractions were very close by. I would strongly recommend it to a friend or relative as long as they don't cut in my time for renting it. Hi Dennis! Thank you for choosing to stay with us at Lucky Savannah! We will make sure we keep your rental open some just for your return. We would hate to have your family fight over it :)! Very convenient with easy parking.great location for walking the whole historic district and very comfortable with everything you need for great stay.i would not hesitate to choose this property. All we needed with the 1 bedroom, 1bath. 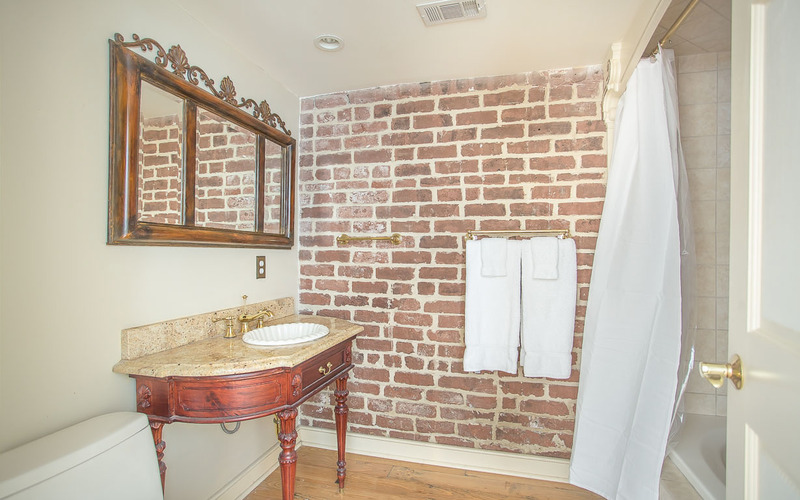 Loved the exposed brick walls. Storage in the kitchen could be cleaner. Need a bigger bathroom sink and better lighting in bathroom and living room. Difficult to see in bathroom mirror for make-up, etc. we love animals but sometimes the barking dog above was a little much. I was very impressed with this apartment...I wanted to move in! So much character and very clean and spacious. The location couldn't be more perfect. First trip to Savannah and couldn’t have stayed at a better place. Wonderful quiet location and very comfortable for the two of us. We parked and literally walked everywhere including the river attractions, neighborhood restaurants and pubs. Gorgeous city and added to the list of favorite places to visit. We will definitely be back and stay again. Positives: Beautifully furnished, great location, very comfortable, off/street parking in garage. Quieter side of town and on a peaceful square. Close to River Street, Leopolds ice cream, and the Olde Pink House. Highly recommend! Downsides: Being extra picky here as we would absolutely stay again... House was being painted while we stayed. Workers would arrive at 7:30/8am. They painted over the windows which limited the light coming in. They sprayed our fence and luckily told us as we came back in as there was no wet paint sign up. I still got some paint on me opening the fence. Baby upstairs cried every morning around 7am-7:30am. Didn’t bother us as we get up early. No washer/dryer. Found a razor blade in our courtyard and we had two young children with us. Water pressure in shower was horrible. Tried to fill up the garden tub and could not figure out how to do it. Too comfortable, which made us not want to go out and explore as much as we should have lol. None of these were major issues for us, but may have been for other visitors. Great location, very nice rental! Spent a long weekend in Savannah with my wife. Really enjoyed all there is to do and learn about in the area. The Warren Peace rental is located right on the corner of Warren Square, which is a beautiful square with beautiful live oaks and landscaping. The rental was beautifully decorated, and very clean. 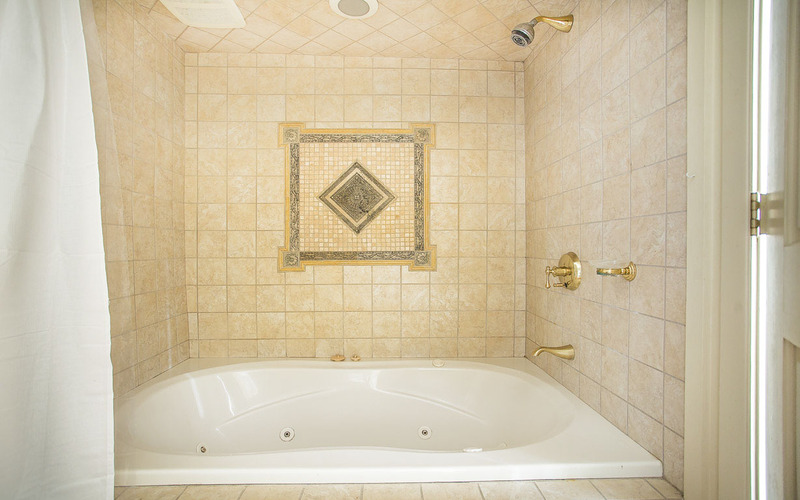 Bathroom is a good size, and the inlay in the shower surround is beautiful. Water pressure in the shower could be better, and the water temperature could be easier to adjust. All in all a wonderful experience I would definitely do again. Minutes from the river walk and a whole lot of really great food and drinks. We decided to head to Savannah for a getaway without the kids and found this place. It was wonderful. The apartment was gorgeous and it was in the perfect location. We were able to walk to everything. I will definitely stay here again and will be recommending it to all my friends. The room was as advertized. We were able to park right at the door to the courtyard our whole stay by buying a parking pass at the visitor center. We were close to everything and walked everywhere we went except Tybee Island which was only 20 minutes away.I would stay there again for sure. Loved Savannah. 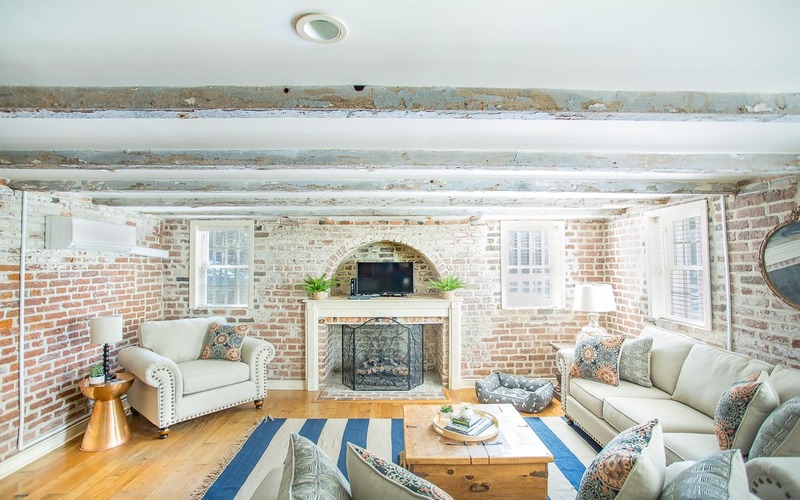 This property is very cozy , a lot of history. 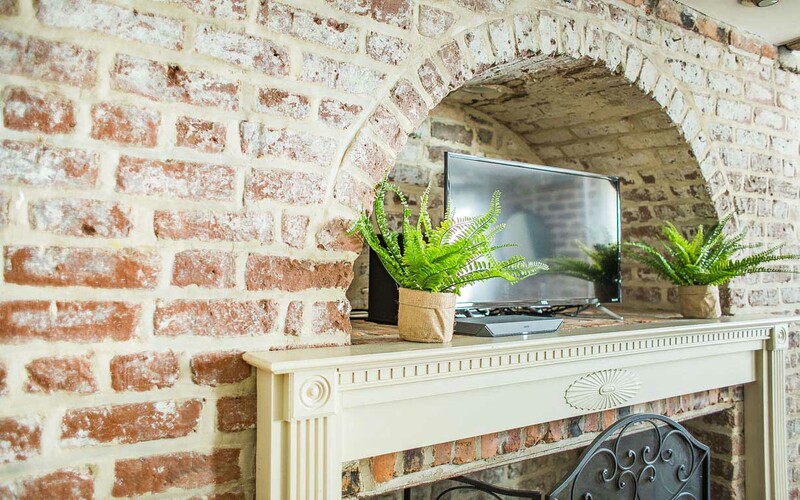 Located so close to many restaurants,shops, the Savannah river and historical places. August in Savannah hot, hot! This apartment is in a great location. Walk to practically everything. There is a good restaurant for breakfast or lunch steps away called B Matthews Eatery. We liked Henry's better for breakfast about three blocks to the west.The apt. is clean and well maintained but the patio could use pressure washing.There is a lot of noise from the upstairs tenants,they don't walk softly they stomp.The house was built for Dr. Parker and he died there from a stroke.Maybe it was his spirit making the noises? I would go back again it is a nice apartment. P.S. Great air conditioning! For groceries and such, Kroger is nearby but not walking distance. For seafood, try the local neighborhood seafood shops like Savannah's Fresh Catch Seafood. You choose and they cook it for you to take home. More affordable than the big seafood restaurants.Overall, a great stay! Stay here during the RNR Marathon. Great Location - walked to everything. One item to note - plan ahead for parking if going on a busy weekend. Thank you choosing to stay with Lucky Savannah! We are so glad you found the location to be great, and enjoyed your stay! We hope to see you again next year. Don't forget about our 10% "Returning Guest" discount! My best-friend and I meet up in Savannah once a year to spend time together. It's our 1/2 way point between her home in Florida and mine in Tennessee. 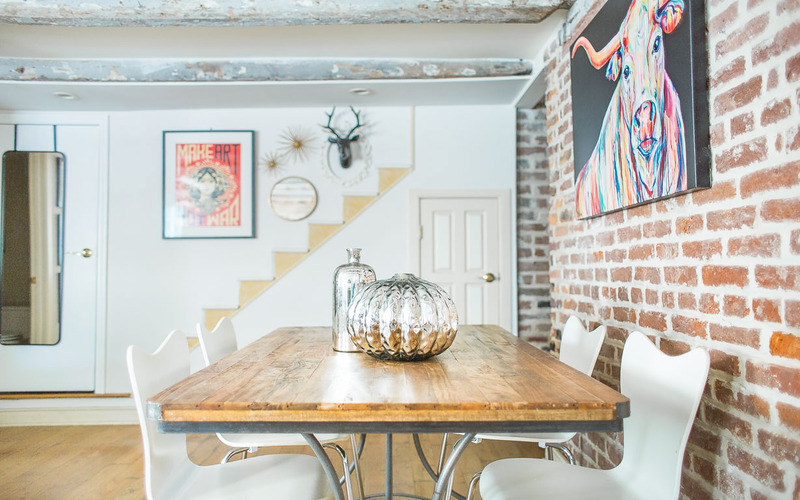 This was the first time we tried a home rental and we were pleasantly surprised. Right across from River Street so we walked everywhere. The apartment had all the modern conveniences while still keeping it's historic appeal. We will definitely use Lucky Savannah rentals every year going forward. If I had any complaint about this specific rental, it was a little noisy. You could hear the traffic pretty well because we were right at ground level. Thank you for choosing Lucky Savannah! We are ecstatic to hear you enjoyed your stay! Savannah is a great place to meet a good friend; many things to do! We are glad you enjoyed the location, as it is convenient to many places! We cannot wait to have you as our guests again! We’ve stayed with Lucky Savannah 3 times now and this stay was our favorite. The kitchen is well-stocked. Home well-decorated and it was perfectly clean and cozy. Plus a lot of light for a garden apartment. We will definitely be back to this hone! We would definitely recommend Warren Peace and Lucky Savannah. The court yard was a peaceful place to relax, and the apartment was beautiful and comfortable.You could not ask for a better location. We were able to walk everywhere. Deborah, thank you for choosing Lucky Savannah! We're so pleased that you enjoyed the peacefulness, location, and comfort of the unit. We hope to see you again soon! 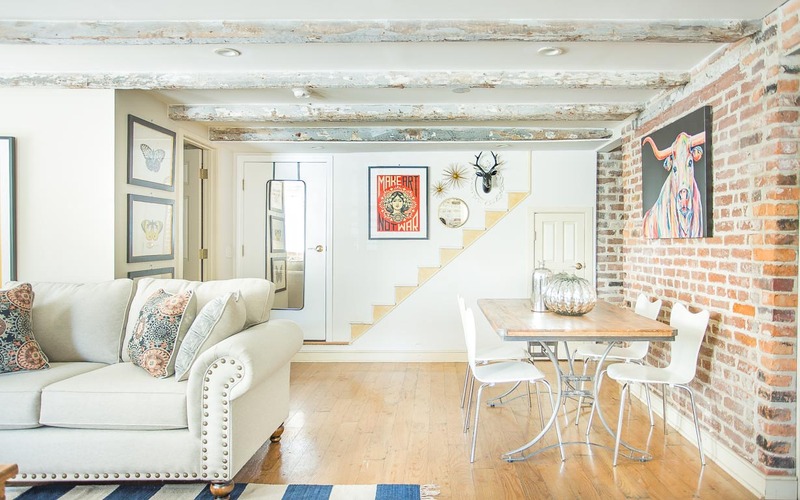 Everything about this vacation rental process was flawless. The apartment is very clean, fantastic location and just what I needed for a weekend getaway. The check in process was very easy and the management company was extremely quick to answer any questions I had. Thank you again for choosing Lucky Savannah, Amy! We look forward to having you again soon. This property was perfectly located for everything. Tesa was very helpful and accommodating when we would call for help. It was very well kept and very modern. Our only issue was with a broken toilet seat and the jets of the tub. The jets could use some bleach but we are shower folks so this was not a big issue for us. 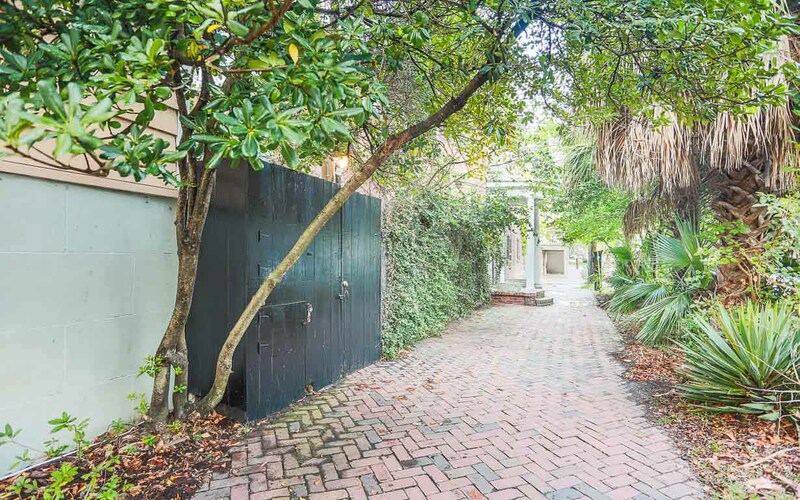 We would definitely reach out to stay in this property in the future when visiting Savannah. Kerri, thank you again for choosing Lucky Savannah! We're so glad to hear that you enjoyed both the location and our service, and have passed your feedback along to the appropriate parties. We look forward to having you soon! Great town, very cool apartment. Hi Debbie! Thank you for choosing Lucky Savannah! We are so glad that you enjoyed your rental and the Hostess City of the South. We hope to see you again soon! Charming apartment in great downtown location! We absolutely love Warren Peace Garden Apartment. I would move in if they'd rent it to me! Very charming, the perfect accommodations. 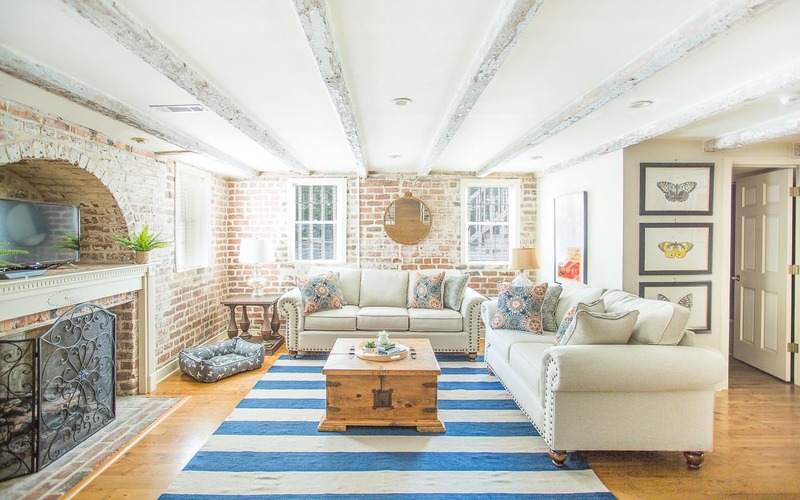 It felt like home immediately - it's beautifully decorated but we felt totally comfortable curling up on the couch with a movie at the end of the day. The location couldn't have been better. Savannah is so walkable, and this spot put us right by the river where we enjoyed taking drinks and watching the boats - but it's also just a few blocks from spots in the opposite direction where we loved to get coffee and lunch. Warren Square is certainly quieter than the others, the only thing you'll really hear are the tours going by - which have a charm of their own and did not disrupt our stay at all! Will plan to stay there the next time we visit for sure. 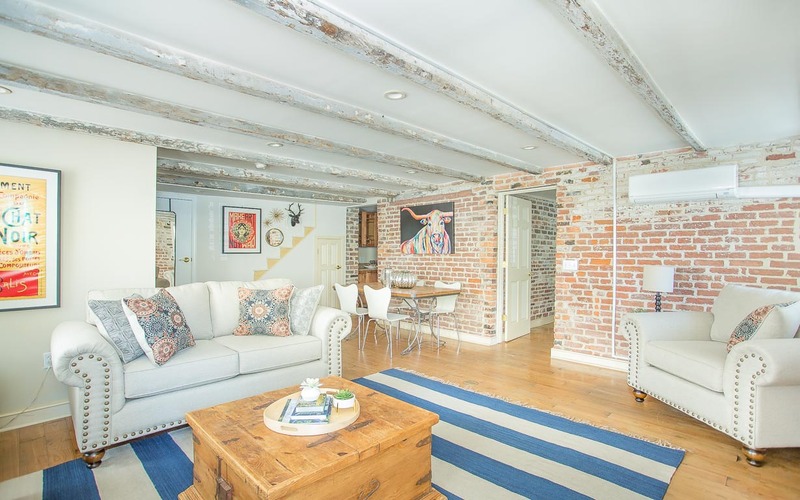 The apartment is conveniently located within walking distance of many historic landmarks, including River St and the market. The apartment was clean, well stocked, and cozy. The staff of Lucky Savannah are very helpful and knowledgeable. Can't wait to visit again. The weekend was wonderful! The apartment is in a great location where you can walk everywhere. I would definitely recommend getting the parking pass for this reason. We ended up getting a parking ticket because the parking laws are so bizarre in Savannah (we're from Athens, Ga and it's not that bad haha). It's a short, beautiful walk to River Street and the ToGo Cup Law is awesome!! The apartment itself is SO cute. The kitchen is fully equipt to make whatever you want! You can cook at home...but everything we ate in Savannah was amazing. Listen to the locals when they suggest restaurants. The bed is comfy and the jacuzzi tub was awesome as well! It was perfect for our long weekend. We felt at home. I even left some stuff there and Lucky Savannah made sure to get it for me the next day. They were happy to ship it to me, but luckily I had a friend who could pick it up! I hope to stay here again the next time I visit Savannah. We absolutely loved this place. We use airbnb often and this one is at the top of the list. We will be back for sure! 5's all about! The Locations is perfect. Close to everything. Walkable. For what we needed, the apartment was fine. A little dark, the lighting was dim and sometimes did not work in the living/dining area. The photo of the garden/patio area is a bit deceiving. It is very small. The bathroom is wonderful. I would stay again. Great hideaway in the garden apartment! The home was perfect! The location was outstanding and easy to walk the city. Everything we needed was provided in the apartment and the Internet worked well. The exterior entry needed washed down but other than that it was perfect. We had such a great time on our visit to Savannah! This property was perfect for our needs. The location could not have been any better! Any complaints that we had were very minor (such as the slow drain in the bathroom sink and the shower curtain liner could stand to be replaced). Otherwise, the unit was very clean and well appointed, the bed was comfortable, and we would definitely recommend it to our friends. Thank you for your part in making our vacation so delightful! We stayed at Warren Peace for 5 nights, 2 adults and our 2 young kids. The location was great. It was close enough to the action but far enough to be quiet and secluded with young kids with early bedtimes. We liked the home and had everything we needed. We also liked that it had original brick and was very cute. One issue though, was the lighting. The main lights for kitchen and living room have dimmers and we could not get the lights to work until our 4th day. The smaller peripheral lights worked and we were gone mostly during the day, so didn't call the management company. We also opened the blinds, but since it is a basement, wasn't very bright. The last issue was we could not find the lock box to get in the house, so had to call the management company. It is a little hidden, but had no problem after speaking with her. 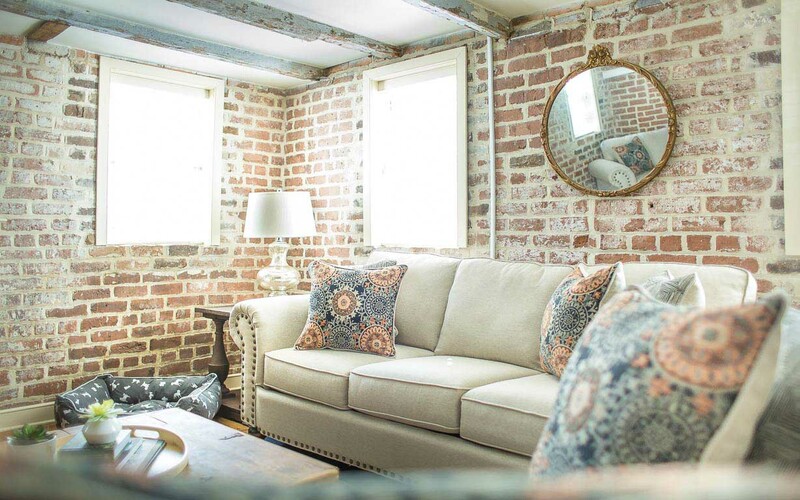 Overall, this was a great little home that we would recommend to friends and would not hesitate to book again when back in Savannah. We rented the Warren Peace Garden Apartment for our honeymoon trip to Savannah. It was perfect for us! It has the feel of being secluded, but you step out and can go left or right into the action of Savannah. It's very close to River Street and shopping. We took a day walking trip through the various squares up to Forsyth park. It was easy to drive to Tybee Island and Bonaventure cemetery from this location. (Hint: you don't have to buy a tour package for the cemetery. It is FREE entry everyday and you can drive throughout the property. Use the $50 per person for some yummy Savannah food or beer!) 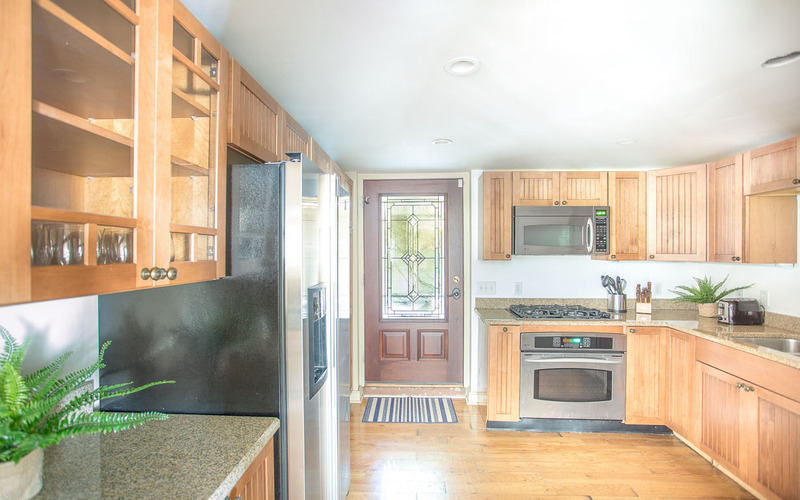 The kitchen is perfect if you do want to cook. The bathroom has a nice big jacuzzi tub. The brick walls were so charming. You can buy 48-hour parking passes at the Savannah Visitor's Center which are valid for the metered spots right in front of the apartment. The only thing that wasn't "perfect" was the brick area right by the front door. It's Savannah and everything is old, but that area seemed a little moldy. Maybe a pressure wash every now and then would help? That said, we would definitely choose this apartment again if we went back. It was a perfect spot for two introverts to be able to recharge from time to time then head back into the action.